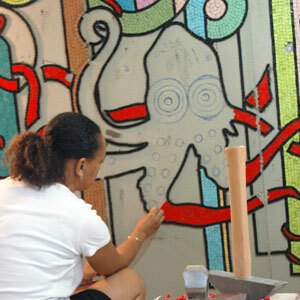 Rachel, mosaic artist in France for the making of custom artworks. Rachel, mosaic artist and garden designer. STUC & MOSAIC is an arts and crafts activity dedicated to mosaic artworks. Since 2019, the workshop also proposes garden design. The workshop was founded in 2004 by Rachel Casimir, mosaic artist, garden designer and current manager. Micro-enterprise for mosaic artworks (Maison des Artistes, Siret 441 161 098) and business portage for craft works or garden design. The mosaic studio offers a unique creative work with mosaics of Greco-Roman, Byzantine, Art Deco, Art Nouveau or Contemporary style. Mosaics are designed in a creative approach for interior decoration (entrance hall, doorstep, decorative furniture, bathroom decoration… etc), exterior decoration (mosaic for pool or decorative basin, garden decor, urban furniture… etc) or restoration (historical monuments or private properties). According to requirements, the method used for the mosaic making may be traditional or adapted to modern materials. All the pictures on this website illustrate projects entirely created in Stuc & Mosaic studio (decorations can vary in size from a small to a large project, created in collaboration with other professional mosaic artists or craftsmen). Mosaic artworks are fully ‘made in France’, often as unique ‘handmade’ piece. Their artistic execution is high quality and durable. No mosaic is imported nor manufactured by children or adults in poor working conditions. Mosaic artwork, like any current or former craft, requires know-how, many hours of manual work, patience, attention to detail and rigour. Fine crafts called today as ‘slow-made’ aim to give value to the time required for the creation of unique hand-made objects, to fair trade and sustainable development. This is the guarantee for the customer of a work of quality, of a neat, unique custom-made product, created with each craftmaker’s artistic sensitivity. The whole content of this website falls under the French and International legislation on copyright and intellectual property. All rights of reproduction are reserved, including iconographic and photographic representations. The reproduction of all or part of this site on any medium whatsoever is strictly prohibited unless expressly permitted by the Rachel, manager of Stuc and Mosaic studio.